It might seem like a small thing: reducing motor vehicle speeds 10 miles per hour. But that 10 mph can make an enormous difference for the safety of a street and how comfortable people feel walking or biking there. If you look at the average speed of traffic on urban commercial streets, there are a lot of things that begin to change when you slow down cars from the 30 to 35 mile per hour range into the 20 to 25 mile per hour range. Most importantly, perception, reaction time, and crash outcomes are far better at 20 than at 30 mph, while traffic flow doesn’t seem to change very much. The perception angle is perhaps the most interesting. 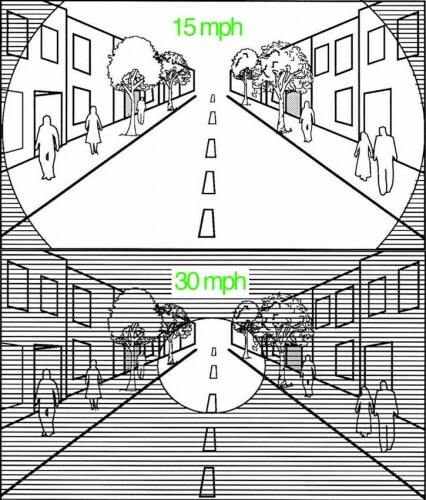 Driving speed has a dramatic effect on the driver’s “cone of vision.” You can see a lot more detail at 20: people on the sidewalk, a bicyclist in the periphery, or the ‘open’ sign on a storefront. At 30 mph, the window shrinks dramatically. The same is true for what you might call ‘reaction time. I’ll often talk to drivers about urban bicycling, and they’ll respond with a terrified story about the time that they “almost hit” a bicyclist that “jumped out” at them. And “I didn’t see them” is a common refrain heard by any police officer investigating a crash. The problem is that once you hit 30+ speeds, it’s a lot more difficult to stop in time to make any difference on a potential crash. These three factors are the big reasons that crash outcomes vary so dramatically on either side of “the critical ten.” It’s no exaggeration to say that lives depend on getting speeds right. Elsewhere on the Network today: The State Smart Transportation Initiative shares new USDA findings about the relationship between transportation and access to healthy food for low-income people. And Carfree Austin says the Texas capital has work to do stitching its street network back together for better walkability. To improve traffic safety and make streets more welcoming for walking and biking, Portland will lower speed limits on nearly all of its residential streets. How Much Would Cyclists Pay to Cover Their “Fair Share”?